This hadeeth is concerning child custody. It relates to a child who reaches the age of discernment (tamyeez, which is normally reached at 7 years of age). The hadeeth that preceded spoke of the younger child who has not yet reached that age. So the child under the age of discernment remains with the mother unless she remarries. So this hadeeth deals with a child who has reached the age of discernment, which is the age of seven. A child of that age and beyond knows what will benefit him and what will harm him (to a reasonable degree). In this hadeeth, the woman came to the Prophet (ﷺ) and said, “O Allah’s Messenger, my husband wants to take away my son. My son is of benefit to me, he brings me water to drink from the well of Abu ‘Inabah.” The mother and father disputed over their son who had reached the age of discernment. So what is the ruling in Islam? Answer: The Prophet (ﷺ) allowed him to choose between the father and mother because at his age he knew who would be more suited to him. He knows what he wants, who is suitable, and who is better for him. So he was allowed to choose – if he chose the father, he would go with him. And if chose the mother, he would go with her. So the Prophet (ﷺ) gave him the choice and he chose the mother. And they went away together. This hadeeth and its explanation is a proof that a child who reaches the age of seven (which is normally the age of discernment) has the right to choose between his parents who are separated by divorce and dispute over custody. However, if he does not choose either parent, then lots are drawn between the parents to see who will take custody. And whoever’s lot is drawn takes the child into their care. That is because, in a situation such as this, the drawing of lots is legislated by the Sharī’ah. This was practised by the Children of Israel when they disputed over Mary (Maryam), mother of Jesus and the daughter of ‘Imrān. She was a young orphan, her father was an elder from the Tribes of Israel, but had died. So they disputed over her guardianship as to who would now take care of her. So they draw lots as Allah stated, “They cast their pencils (as lots)” to decide who would take care of Maryam (may Allah be pleased with her). So Zakariyya (peace be upon him), the Prophet of Allah, was successful and won the right to care for her. Furthermore, he was married to Maryam’s aunt. So through the drawing of lots, Maryam came under the care of Zakariyya. So at the age of tamyeez (discernment), the child is given the right to choose between the parents, but if he does not choose or does not wish to choose, then lots are drawn to see who he/she goes to. This hadeeth also is regarding the disputing parents over the custody of a child. Here the father was a Muslim, and the mother was a non-Muslim. They disputed in front of the Prophet (ﷺ), so the Prophet gave the boy a choice between the two parents. So he initially inclined to the mother, and then the Prophet (ﷺ) supplicated for him, “O Allah, guide him.” Meaning, guide him to what is correct. Allah answered the supplication of the Prophet, and the child chose the father. Some scholars state that custody of a Muslim child cannot be given to a non-Muslim, due to the saying of Allah (the Most High), “Allah has not made for the unbelievers a way [i.e. of guardianship] over the believers.” (An-Nisā’ 141) The scholars have said that this woman was an unbeliever, to begin with, but then she accepted Islam. That is because she was from the children of the Ansār (Helpers) of Madinah, and there did not remain any woman from the Ansār except that she accepted Islam. Al-Barā Ibn ‘Āzib (may Allah be pleased with him) said: “The Prophet (ﷺ) gave a ruling regarding the daughter of Hamzah that she be given over to the care of her maternal aunt.” And the Prophet (ﷺ) said, “The maternal aunt is in the position of the mother.” (Reported by Bukhāri no. 2699). Ahmad reported the hadeeth from ‘Ali (may Allah be pleased with him) that the Messenger (ﷺ) said, “The young girl must go to the maternal aunt because the maternal aunt is the same as the mother.” (Al-Musnad no. 770). So this incident took place at the time of the Prophet in a dispute over custody rights. It was regarding the daughter of Hamzah (may Allah be pleased with him), known as the ‘chief of the martyrs’ who was killed at the battle of Uhud. His daughter was young, living in Makkah. So when the Prophet (ﷺ) conquered Makkah, the girl made herself known and asked for her paternal uncles (i.e. their family). Her paternal uncles were: ‘Ali Ibn Abee Tālib, Ja’far Ibn Abee Tālib (both were nephews of Hamzah) and Zayd Ibn Hārithah the freed slave of the Prophet (ﷺ). Zayd was considered the brother of Hamzah through the “brotherhood-bonds” of Islam (mu’ākhāt) introduced by the Prophet (ﷺ). The Prophet had made a bond of brotherhood between Hamzah and Zayd when they migrated to Madinah. 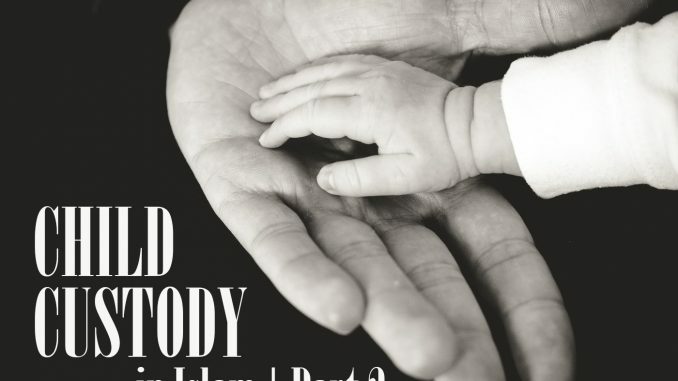 So one of them said, “This is the daughter of my uncle” and the other one said, “This is the daughter of my brother through a brotherhood-bond.” So the Prophet gave the custody to Ja’far Ibn Abee Tālib (may Allah be pleased with him) because Ja’far was married to the girl’s maternal aunt, Asmā bint ‘Umays. So the custody (in reality) was given to her and he said, “The maternal aunt is in the position of the mother.” This hadeeth proves that the maternal aunt takes the position of the mother in the affair of custody (hadānah) – so the Prophet gave the child to her and she was the wife of Ja’far. Abu Hurayrah (may Allah be pleased with him) said that Allah’s Messenger (ﷺ) stated, “When one’s servant serves him food, and he does not sit his servant down with him to eat then at least pass him a morsel or two of the food.” (Reported by Bukhari no. 2557, and Muslim no. 1663) This hadeeth is related to the good treatment of those under one’s care, even if it be a slave. Al-Ma’rūr Ibn Suwaid said: I met Abu Dharr (may Allah be pleased with him) at Rabadhah and he was wearing a cloak while his slave was wearing the same type of cloak. So I asked him why he had dressed his slave so well? He replied, “I abused a person once, by speaking badly about his mother.” So the Prophet (ﷺ) said to me, “O Abu Dharr! Did you abuse him by calling his mother names? Verily you still have some traits of Jāhiliyyah (pre-Islamic ignorance). Indeed your slaves are your brothers, and Allah has put them under your command. So whoever has a brother under his command should feed him from what he feeds himself, and dress him in whatever he himself dresses. Do not ask him to do things that are beyond their capacity, and if you do so, then help them.” (Bukhāri no.30) It is obligatory upon the master that he provides for his slave. However, the previous hadeeth has an added benefit and that is that when the slave prepares food for his master, then it from the good manners and good conduct of the master that he offers it to the slave. That he does not prevent the slave from eating that which he worked hard to prepare. It is not befitting, and not from being honourable and kind that one mistreats his slave in this manner. Rather the master should allow the slave to participate in the meal that he has prepared. The permissibility of keeping pets such as birds and cats, even if they are somewhat confined, but they must be given food and drink and the ability to move around without being harmed. If one is not able to provide that, then the creature must be released to fend for itself from the earth (by returning it to its natural environment). If a person does not provide that, and the animal dies whilst in their care due to neglect then he is threatened with the Hellfire as a just punishment. This hadeeth shows the excellence of Islam, its mercy and compassion towards other creatures, even small animals that do not serve humans in any way, such as a cat. A cat is simply a pet and a comfort to the eyes serving no further purpose in most cases. So if one keeps a cat, he must feed it and look after it, and the same goes for dogs, tigers, birds of prey, wolves and lions that people sometimes keep and confine. Taken from Shaikh Sālih al-Fawzān’s explanation of Buloogh al-Marām min Adillatil-Ahkām of Al-Hāfidh Ahmad Ibn ‘Alee Ibn Hajr al-Asqalānee (Born 773H, Died 852H). Shaikh Al-Fawzān’s tremendous explanation is entitled Tas-heel al-Ilmām bi-fiqhil-Ahādeeth min Bulooghil-Marām and is printed in seven volumes. The above is a translation of this important and very enlightening chapter (from volume 5), adapted slightly in places, and more detail added to ease understanding.